Summer Tomato and Bell Pepper Crops Are In! Vertical Tomato and Bell Pepper Gardens Are In Stock! But they will not be around for long! Get yours before it is gone! Vertical Summer Vegetable Gardens Are In Stock! You choose what size you want your garden to be and what you want to grow, and we send you everything you need! We do more than edibles! You will find a wide variety of Tropical Gardens, Heat Tolerant Gardens, and much more! Get everything you need - Living Wall Kits with Automatic Irrigation! 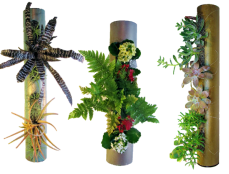 Fun new Vertical Gardening product. Hang it on any wall or lay it on an surface! So you can grow on your walls...Now all you need is enough light to support those plants! Find it here!